Zheng Liu and Mark Spiegel at the San Francisco Fed wrote a very nice letter on demographics and asset prices, summarizing a lot of good academic work on the question. 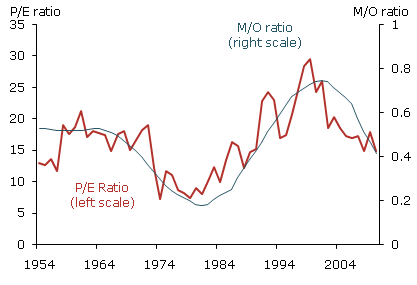 See the graph to the left, taken from the letter: M/O is the ratio of middle aged to old, and P/E is the stock market price-earnings ratio. It seems like a natural story: In the 1970s, there were relatively few prime-age savers around to buy stocks, and the prices fell. Starting in the 1980s to late 1990s, boomers entered their prime saving years, bought stocks and drove the prices up. And now that the boomers are retiring, they start selling, and watch out for prices! Zheng and Mark make a pretty discouraging forecast. These facts dovetail with research (my summary here, but lots of people have made this point) that high price/earnings ratios correspond to lower subsequent returns, and low price/earnings ratios correrpond to higher subsequent returns. One alternative story is that low prices come when people expect low growth in cashflows, and high prices come when people expect better future cashflows. That story does not turn out to be true on average. So the buying and selling pressure view is consistent with those facts. I'm still not convinced, however, for a few reasons (all completely acknowledged by Zheng and Mark -- no fight here, we're just dissecting the evidence). First, empirically, movements in stock prices are about the equity premium, how much more you expect to earn on stocks rather than bonds, not the overall level of returns. Stock prices are about the willingness to bear risk, not about saving or dissaving. If it's all about saving and dissaving, we should see bond prices and yields (adjusted for expected inflation) move right along with stock prices and expected returns. To construct a demographic theory of stock prices and returns we have to argue not that people want to save more in middle age, but that they become less risk averse in middle age. Maybe, but it's a different story. Second, markets are internationally linked. There may not be any American savers to sell your stocks to when you retire (especially if the taxation of investment returns rises sharply). But there will still be a billion Chinese! Empirically, you can see there are about three data points, and Zheng and Mark acknowledge playing a bit with the demographic data. Lots of other things generate the same correlation with P/E ratios. In my research, I've been emphasizing the link to economic conditions that you can also see in the P/E plot -- good prices in good times, bad prices in times of recession or stagnation. However, this is also a more important question than people think. Stocks earned about 8% real and about 6% or so more than bonds over the long histories of data we have, starting in either 1926 or post WWII. Many people bake in the idea that we will continue to get great returns like these in the future. Many pension funds discount there liabilities at these high rates of return. Maybe, maybe not. There are lots of stories that the expected return on stocks for the next 20-30 years could be a lower. Wider participation via index funds and 401(k) -- wider risk sharing -- is one. Demographics, whether local or global, are another. The chance that we will enter a few decades of slow economic growth is another. "Who will you sell your stocks to when you retire?" is an important question. With limited data, thinking through the various stories to see if they make sense is the only way to make much progress.